“If it is not too late I should certainly like to do the article . . . "
Brendan Francis Behan, 1923-1964. Irish poet, author, and playwright. 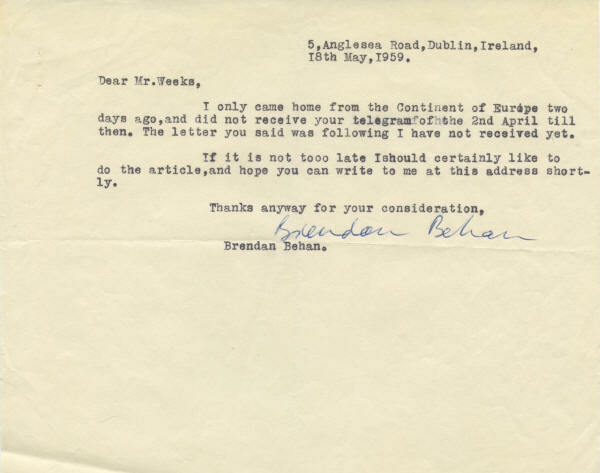 Typed Letter Signed, Brendan Behan, one page, 6½" x 8”, Dublin, Ireland, May 18, 1959. Behan's letters are rare. Behan, a heavy drinker, died early at age 41 from a combination of alcoholism and diabetes. Thus his autograph material is scarce overall, and most of what has appeared on the market has been in the form of signed books. In this letter, Behan expresses his eagerness to write an article for The Atlantic Monthly. He writes to editor Edward Weeks, in full: “I only came home from the Continent of Europe two days ago, and did not receive your telegram of the 2nd April till then. The letter you said was following I have not received yet. / If it is not too late I should certainly like to do the article, and hope you can write to me at this address shortly. / Thanks anyway for your consideration . . . ."
A former member of the Irish Republican Army, which he joined at age 14, Behan served prison sentences for attempting to blow up the Liverpool docks, for attempting to murder two Dublin detectives, and for trying to help a fellow Republican break out of jail. His career as a terrorist was over by age 23, but his prison time formed the core for much of his later writing. Behan has signed this letter in blue ballpoint. The letter has horizontal and vertical mailing folds, the latter of which passes through one letter of his signature. The paper is irregularly torn at the bottom, and there are staple holes in the blank upper left margin and scattered wrinkling. Overall the letter is in fine condition. Click here to see other world authors' autographs.